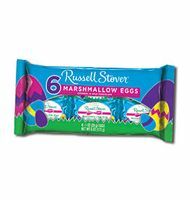 Rich milk chocolate covered marshmallow eggs by Russell Stover. These make the perfect Easter Basket candy or a sweet treat just to eat. Each pack has 6 eggs.